Space Battleship Yamato is three-dimensionalized with the final battlefield specification from "Space Battleship Yamato 2202 Love Warriors"! 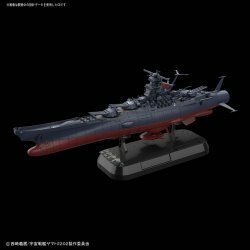 Reproduce the final battle Space Battleship Yamato in the setting image with new molds such as the main turret and deck, improved guns and weapons! Regular version and final battlefield specification can be reproduced selectively. Dedicated pedestal, ship bottom corresponding to Action Base 1 etc are attached. The bridge, the ship's wave motion gun, the wave engine correspond to the optional LED.